Most of those products are now on the auction block. Various media outlets have reported that Yahoo has received offers exceeding $3 billion for a portfolio of digital services that includes the company’s email, news, sports and finance sections. Yahoo has steadfastly refused to provide any updates on its deliberations since its board hired investment bankers and other advisers to round up prospective buyers four months ago. Mayer told shareholders Thursday that she has been encouraged by the level of interest in Yahoo’s internet business, though most analysts initially thought the company would fetch more than the $4.4 billion that Verizon paid for AOL last year. The company restricted attendance to Thursday’s meeting in Santa Clara, California, to shareholders and their appointed representatives, forcing The Associated Press and other media to watch the proceedings on a webcast. Yahoo also recently began soliciting bidders for a package of about 4,000 technology patents, representing most of its intellectual property. Yahoo’s auction stems from the company’s inability to boost its revenue during the past eight years even though advertisers have been steadily increasing the amount of money on digital marketing. Its revenue has fallen from $5.1 billion in 2008 to $4.1 billion last year, with another decline of as much as 17 percent to $3.4 billion projected for this year. Most of Yahoo’s current market value of $35 billion is locked up in stakes that it holds into China’s e-commerce leader, Alibaba Group, and Yahoo Japan. In a tacit acknowledgement that her previous turnaround plans had gone awry, Mayer pivoted at the beginning of the year and started to close Yahoo’s least profitable services, including a video operation and digital magazines hatched during her reign. Mayer is also laying off 15 percent of Yahoo’s workforce to whittle the payroll to 9,000 employees and trying to pull off a spin-off that would put the internet operations into a separate company. Yahoo Inc. would then become a holding company for Alibaba Group, and Yahoo Japan. 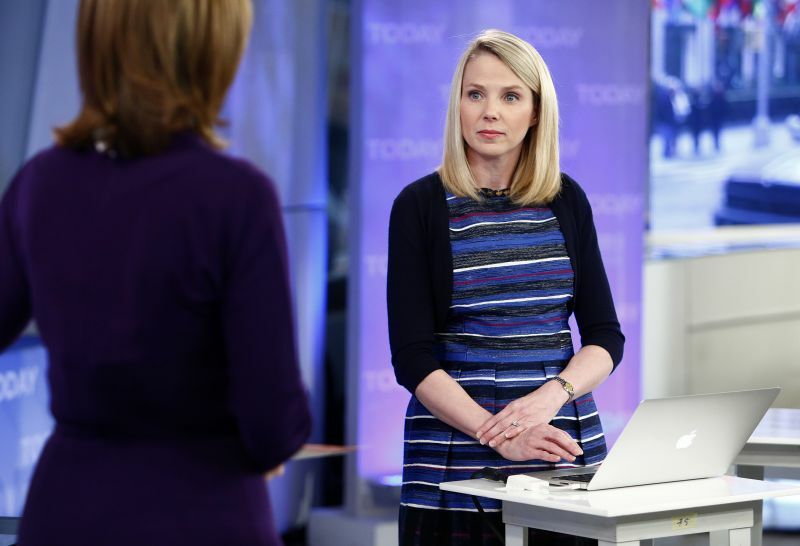 Yahoo’s stock ended Thursday up 70 cents, or almost 2 percent, at $37.56. It is up almost 13 percent in 2016.